A new sculpture calls attention to climate change in the centuries-old city it threatens. 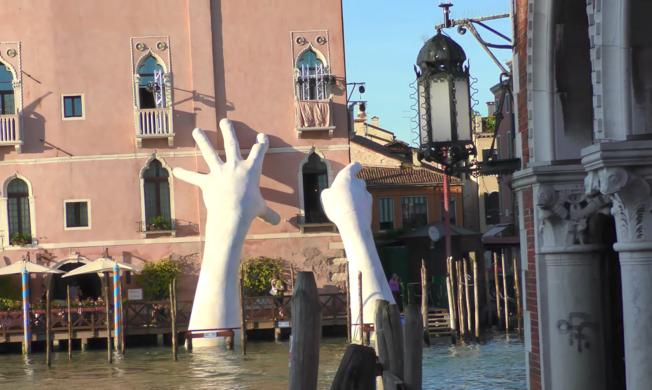 Sorry, Giant Hands of Venice’s Grand Canal is permanently closed. As hordes of tourists ride gondolas through Venice’s world-famous Grand Canal, they will find themselves among entirely historic architecture—that is, until they reach Venice’s Ca’Sagredo Hotel. Here, a brand new art installation hugs the 14th century walls, addressing a modern problem faced by a centuries-old city. Venice's "Island of the Mad." According to some scientists, the Mediterranean is set to rise by five feet by the end of the century, meaning the Floating City could be almost entirely submerged by as early as 2100. 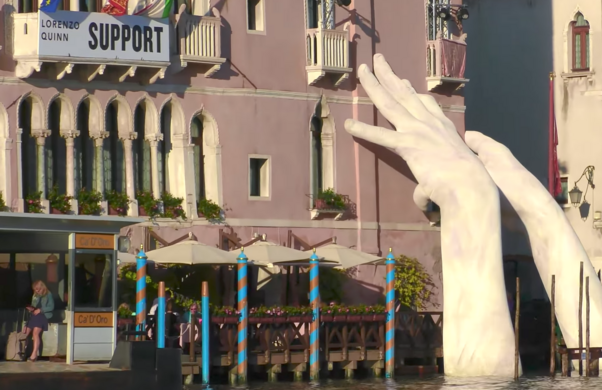 The art installation, called “Support,” created by artist Lorenzo Quinn, the son of actor Antony Quinn, is a pair of 5,000-pound white hands, finished with creases, fingernails, and other fine details. 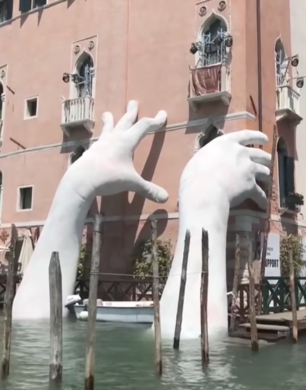 The human hands appear to prop up the historic hotel from falling into the water, symbolizing the threat that climate change has on history, but also the power that mankind has to stop it. The sculptor intentionally based the shape of the hands after his children, to show the innocence, and power, of the next generation. 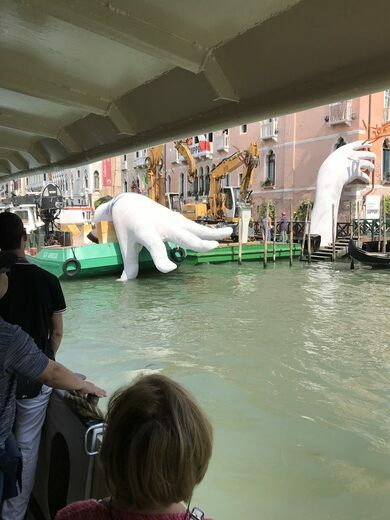 Originally molded in a Barcelona studio, Support was carted by boat to Venice’s Grand Canal, where it will remain until November 26, 2017. Update May, 2018: Sadly, this sculpture has been removed. The marble facade hides a little-known medical museum with early surgical instruments and rare copies of canonical texts. This palatial spiral staircase was so unusual the name "snail" was given to the noble family who built it. This Venice bookstore has resigned itself to constant flooding by keeping its books in bathtubs and boats. A sinister pyramid in the Frari contains the heart of the famous neoclassical sculptor. This striking steel sculpture transforms environmental data into art. A little-known sculpture park of contemporary environmental art in a Lapland forest. There are eight natural springs around town, each with a slightly different taste. Remarkably realistic Florida shoal bass "swim" inside this large globoid sculpture.